Whole, dark sweet cherries and smooth cherry puree are layered with creamy non-fat Dannon® Greek yogurt. It's topped with a new blend of Vanilla Macaroon granola. 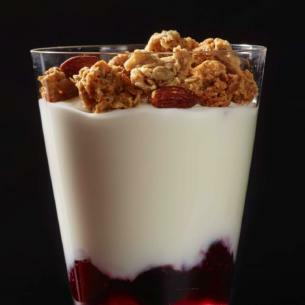 plain nonfat greek yogurt (cultured grade a nonfat milk [contains active yogurt cultures]), cherry compote (dark sweet cherries, dried cane syrup, red tart cherry puree, cornstarch, lemon juice concentrate), macaroon granola (whole rolled oats, milled cane sugar, vegetable oil (canola and/or safflower and/or sunflower oil), rice flour, coconut, cornstarch, almonds, honey, natural flavor, salt, barley malt syrup, cardamom seed, fennel seed, fenugreek seed, nutmeg). produced in a facility that processes tree nuts, wheat and soy.